A game that combines shooter and hack and slash mechanics. It was created by One More Level - a Polish developer popular for Warlocks vs Shadows. The protagonist is called Zoran and he is a veteran of the Balkan Wars, who escapes from war atrocities to New York. 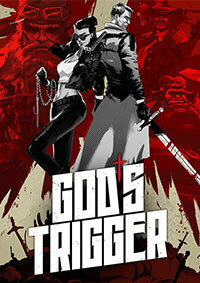 God's Trigger for PC, PS4 and XONE is a three-dimensional mixture of a shooter and a slasher. The game uses the top-down view and it was developed by One More Level - a Polish team popular for the successful Warlocks vs Shadows. A priest called Zoran is the protagonist here. He had fought in the Balkan Wars once, but escaped the battlefields under the influence of atrocities he had witnessed. In order to serve his penance, he became a local priest in New York. Now, he reaches for his weapons again however, having decided to fight evil and sin the hard way. Although God's Trigger for PC, PS4 and XONE is a very dynamic game which does not tolerate the player's mistakes (one hit kills the protagonist), tactical planning is part of it nonetheless. The player can activate the so-called Divine Focus mode, which is a mechanic similar to what could be observed in SUPERHOT. As a result, using this ability makes the time pass only when the protagonist moves. In this game however, it works quite differently, for Divine Focus is a limited ability that has to be recharged by killing enemies. Zoran makes use of both firearms and melee weapons - a wide variety of destructive tools falling into these two categories was included in the game. Apart from the story campaign for solo experience, God's Trigger offers separate levels for the co-op mode. Those can be completed by two players either sitting at one computer or connected via the internet. Lastly, it is worth mentioning about several aspects regarding the visuals. Contrary to many top-down view games, God's Trigger for PC, PS4 and XONE is a three-dimensional title offering cel-shaded graphics, which makes it resemble comic strips to a certain degree.